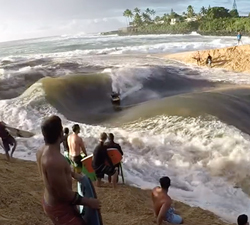 A more pulled back angle of the recent Waimea Bay River session that went down recently. Footage: @adrianbullethose. Three minutes of shred at home with 2017 Women’s World Champion Joana Schenker. Brought to us by Timelapse Media. 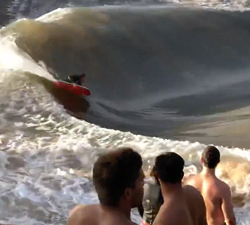 Some cool drone footage of a recent swell to hit Posto 5 in Rio de Janeiro. Shoot and edit: Guilherme Botelho. A short clip featuring Eric Barberon in Arica. Camara: Danton Correa. Edit: Martin Dabos // Mdaudiovisual. The legendary Dave Winchester shredding some East Coast (AUS) wedges. Shoot and edit: Caleb Graham Films. Ben Player tucking into some French pits during a recent trip. Filmed and edited by Riraw Prod.